Add relaxing in the cozy Sonax Park Terrace collection to your exciting summer plans. The Textured Black Resin Rattan Weave is complimented by high quality, weather resistant foam seat cushions wrapped in zippered and washable Salt and Pepper seat covers. With our clever design, the Ottoman can easily be converted into a stout coffee table by removing the cushion. Ready to use upon delivery, you can complete your summer with this comfortable patio set from Sonax. Looking to give your living area a fashionable dicor boost? Then this round faux fur upholstered ottoman is just perfect for you. With a trendy, super-soft and well finished faux fur upholstery, you will experience comfort like never before. Our shaggy but unique concept will highlight your classy taste. The cool round contemporary design will give your room that lavish touch, sitting delicately, yet perfectly steady, upon stable black metal hairpin legs. You will love it. Modern elegance and practicality are key highlights of this multipurpose ottoman. Providing generous storage space to store umbrellas or pet accessories in your entryway, or throws and magazines in your living room or bedroom, it can also be used as additional seating when you need it most. Classical scripted white text against the black fabric adds visual interest and subtle flair. Get organized and make clean up simple with this 15" folding storage ottoman.. The ottoman provides more than one cubic foot of storage space. It is large enough to hold toys, board games, throws or any other small items in your home. Turn the cushion top over and use the tray top surface. Park Terrace Textured Black Ottoman Add relaxing in the cozy Sonax Park Terrace collection to your exciting summer plans. 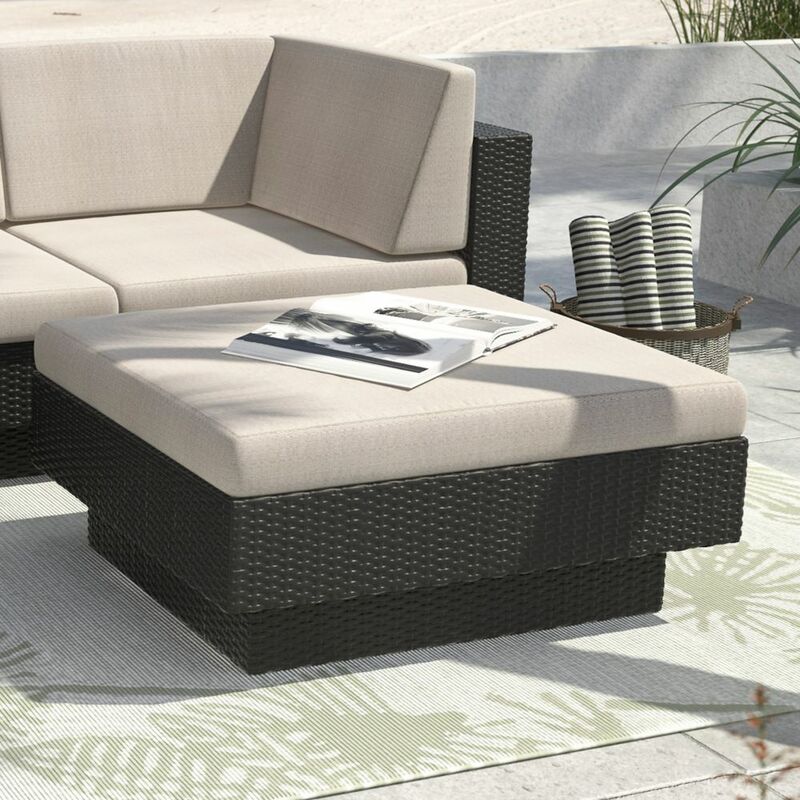 The Textured Black Resin Rattan Weave is complimented by high quality, weather resistant foam seat cushions wrapped in zippered and washable Salt and Pepper seat covers. With our clever design, the Ottoman can easily be converted into a stout coffee table by removing the cushion. Ready to use upon delivery, you can complete your summer with this comfortable patio set from Sonax.